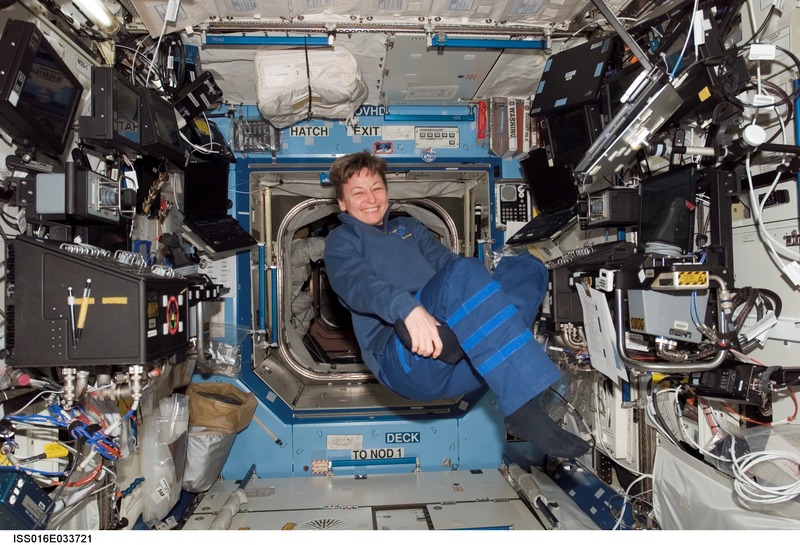 NASA astronaut Peggy Whitson served as commander of the International Space Station's Expedition 16 in March 2008. 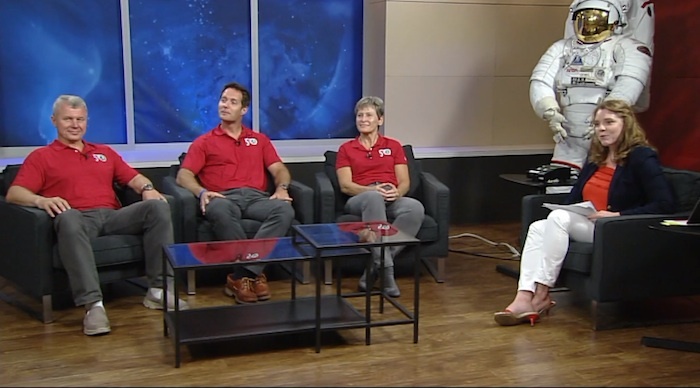 NASA is inviting media to attend a news conference and conduct one-on-one interviews Tuesday, Aug. 30, at NASA’s Johnson Space Center in Houston, with three crewmembers currently preparing for a November launch to the International Space Station. The 2 p.m. EDT news conference will air live on NASA Television and the agency’s website. 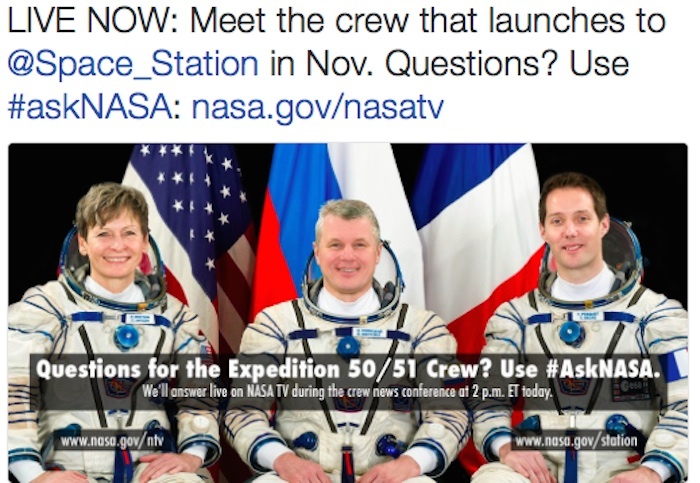 The Expedition 50/51 crewmembers are NASA astronaut Peggy Whitson, Thomas Pesquet of ESA (European Space Agency), and Oleg Novitsky, of the Russian space agency Roscosmos. This will be Whitson’s third long-duration stay on the space station, the second expedition for Novitsky, and Pesquet’s first trip to the space station. NASA TV will air a 30-minute video of crew training immediately preceding the news conference, and all three crew members will be available for individual media interviews afterward, in person or by phone. To request credentials to attend, or reserve an interview opportunity, U.S. media must contact the Johnson newsroom at 281-483-5111 by 6 p.m. Friday, Aug. 26. The deadline for international media accreditation has passed. To participate in the news conference by telephone, media must contact the newsroom at least 10 minutes prior to its start. Those following the briefing on social media may ask questions using #askNASA. 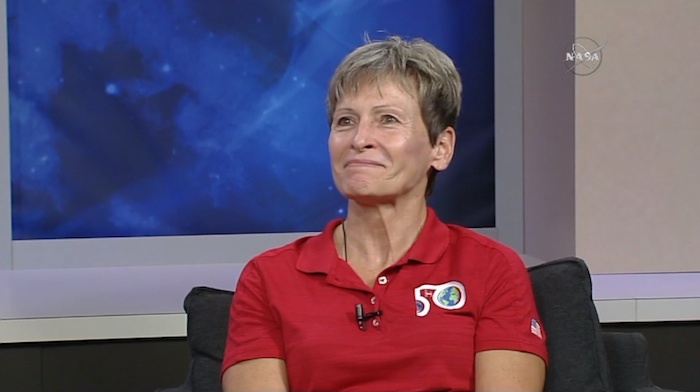 During her stay in space, Whitson will become the first woman to have commanded the space station twice, and will break Expedition 48 Commander Jeff Williams’ approaching record for most time spent in space by a U.S. astronaut. Whitson, Pesquet and Novitsky will launch to the space station from the Baikonur Cosmodrome in Kazakhstan. The trio will join Expedition 50 Commander Shane Kimbrough of NASA, and cosmonauts Andrei Borisenko and Sergei Ryzhikov of Roscosmos, who are scheduled to arrive in September. While aboard the world’s only orbiting laboratory, Whitson and her crewmates will facilitate some 250 research investigations and technology demonstrations not possible on Earth. Among the experiments is Lighting Effects, which will investigate the impact of a new solid-state, light-emitting diode (LED) system on the crew’s circadian rhythms, sleep and cognitive performance. The Neutron Star Interior Composition Explorer (NICER) experiment is scheduled to arrive at the station during the crew’s stay and will examine the physics, nature and dynamics of neutron stars. Experiments such as these yield benefits for all of humanity, and will enable future long-duration human and robotic exploration into deep space, including the agency’s Journey to Mars. Whitson was born in Mt. Ayr, Iowa, and considers Beaconsfield, Iowa, her hometown. She earned a bachelor’s degree in biology/chemistry from Iowa Wesleyan College and a doctorate in biochemistry from Rice University. 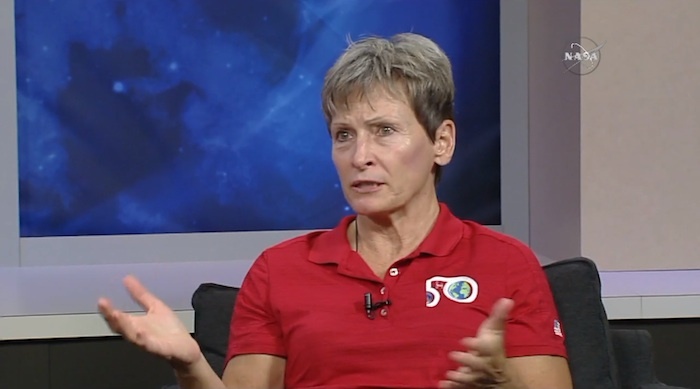 Whitson held a number of positions at NASA, ranging from research biochemist to co-chair of the U.S.-Russian Mission Science Working Group, before being selected as an astronaut in 1996. Since then, she served as a flight engineer for Expedition 5 in 2002, commander of Expedition 16 in 2007 and chief of NASA’s Astronaut Office from 2009 to 2012. Whitson has spent 377 days in space and performed six spacewalks.